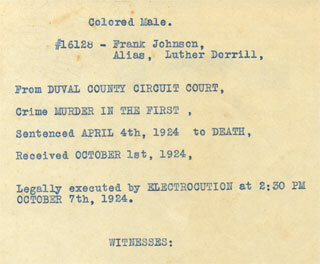 On this date in 1924, “colored male” Frank Johnson was electrocuted in Florida. He was, in fact, the very first to die in the Sunshine State’s electric chair. The original Florida electric chair. 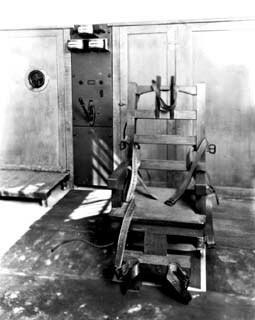 “Old Sparky” (numerous electric chairs shared this nickname) was brand new here in the Roaring Twenties, a jerry-built contraption outfitted with “homemade accessories” to replace the icky old gallows with a brave new world’s brave new mankiller. 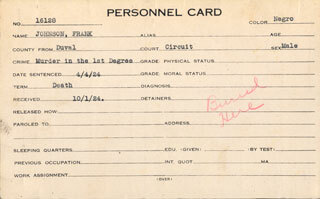 Top: a scantily-detailed penitentiary “personnel card” for Frank Johnson. Middle: details of the execution. 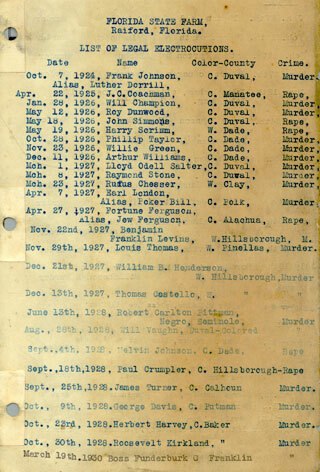 Bottom: Florida’s official typed list of its early executions. All images are from this Florida Department of Corrections page. This same furniture that killed Johnson would ultimately take the lives of 265 men and one woman — notables from Giuseppe Zangara to Ted Bundy, milestones like John Spenkelink, and scores of strange and forgotten perps among them. Notoriously error-prone by the end of its run, the device was finally replaced in 1999. 265? Where did you come up with this number? Up through 1964 there were 196 electrocutions in Florida. From 1979-1999 there were another 43 in the original chair and one in the brand new chair. A total of 239 in the original chair, 240 total.